Until the end of the month, visitors to Western Spirit, Scottsdale’s Museum of the West, can take a look back in time through the work of the Taos Society of Artists. Although undergoing rapid change, a bit of the Old West could still be found in Taos, New Mexico, in the early years of the 20th century. The dramatic landscape around Taos provided the backdrop for a vibrant mix of Native American and Hispanic culture. Change was coming fast, but these links to the past were the focus of the six painters who formed the Taos Society of Artists in 1915. The Society’s founding members were Oscar E. Berninghaus, Ernest L. Blumenschein, Eanger Irving Couse, William Herbert “Buck” Dunton, Bert Geer Phillips, and Joseph Henry Sharp. All of these men were formally trained artists (all but one studied in Europe) and all loved painting the people of Taos. While sharing an interest in the local population and customs, they worked in a variety of artistic styles. The Taos Art Society was created to jointly market the work they produced – and the beauty of Taos and its people – to the rest of the country. Over time additional artists were invited to join the Society. To become a member, an artist must have worked in Taos for three years, have a talent for painting Native Americans, and have shown their work in reputable salons and galleries back east. Over time, Kenneth Adams, Catherine Carter Critcher, Ernest Martin Hennings, Victor Higgins, Julius Rolshoven, and Walter Ufer joined as active members. In addition, a number of noted Santa Fe artists working with similar themes were included as associate members. These were Gustave Baumann (one of my favorite artists from this period), Randall Davey, Albert Groll, Robert Henri, Bror Julius Olsson (B.J.O.) Nordfeldt (who later worked in Minnesota), Birger Sandzén, and John Sloan. While the Taos Society of Artists existed only until 1927, it had a lasting impact on Taos, the Taos art community, and on the very idea of what the American West was and is. For its exhibit on the Taos Society of Artists, Western Spirit, Scottsdale’s Museum of the West, brought together more than 80 images from public and private collections around the country. The show is arranged by artist, with at least one painting by each of the 12 member artists and seven associate members. This structure gives visitors a peek at each artist’s range of subjects and style over time. In addition, whether they were a romantic or realist, the artists sought to invoke a specific emotion in their viewers. This goal may or may not have led to accurate portrayals of their subjects. These are works of art, not historical documentation. Despite that, the public often saw these paintings as accurate depictions of Native American life. Thus, due to its popularity, the work of the Taos Society of Artists played a significant role in shaping perceptions about Native Americans far beyond Taos. The following includes some of the artists and artwork in the exhibition that caught my eye. I’ll start with Joseph Henry Sharp, as he is both the group’s founding figure and its core. He was the first to visit Taos (in 1893) and his excitement about the area (and a broken wheel) brought Ernest Blumenschein to Taos five years later. Sharp’s interest in Native American culture began as a child in Ohio and continued through his life. His early paintings are accurate, highly detailed depictions of Native clothing and culture. However, over time he became more interested in the emotional impact of his paintings than their historical accuracy. To achieve the romanticized effect he was seeking, he often posed his models with clothing and props from other tribes. Like Sharp, E. Irving Couse also grew up with an interest in the Native American tribes that lived near his childhood home in Michigan. A founding member of the Society, today he is best known for his images of Native men illuminated by firelight. However, he also has images that feel less contrived, such as this one based on a Hopi ceremony he attended in 1903. In contrast to Sharp and Couse, founding member Ernest Blumenschein was a modernist. He didn’t romanticize his subjects and his bold paintings hint at a darker, complicated reality. I like the fact that they leave me wondering what exactly is going on in each painting. Founding member Oscar Berninghaus was a commercial lithographer before becoming a painter. I like the more graphic style found in many of his paintings and the way the landscape often plays a role equal to or greater than that of his human subjects. 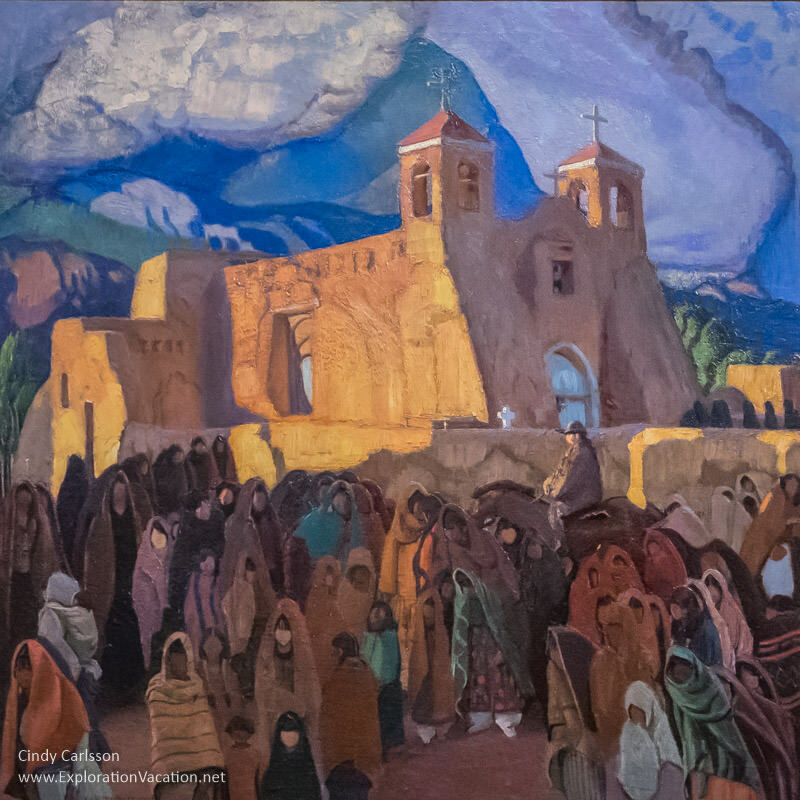 Trained as both a lithographer and artist, Walter Ufer was invited to join the Taos Society of Artists in 1917. A realist through and through, his bright, colorful images often portray daily life in Native American community of Taos. A committed socialist, his art reflects his respect for hard-working men and the downtrodden. American expat Julius Rolshoven was an accomplished and well-regarded artist in Europe before he became a member of the Society in 1918. Unlike most of the work produced by other members, he painted in a classical European style. While enamored with the people of Taos as subjects of his art, he spent only a few years in Taos before returning to Europe. A unanimous vote of the membership made Catherine Carter Critcher a member in 1924. She was the only woman in the Society and the only member to never live in Taos full-time. Her specialty both in Taos and at home on the East Coast was portraiture. However, the Western Spirit exhibition also has this wonderful image of a couple husking corn. All of the artists worked together and learned from (and argued with) each other. Apparently Critcher benefited from her contact with Ufer and other artists who helped the society portrait artist move from single subject portraits to scenes with multiple figures. She certainly handles the situation well here! Although the Taos Society of Artists had strict rules for who could become a member, successful artists working outside Taos, but working with the same subject matter, were sometimes invited to become associate members. Robert Henri, a painter, artistic realist, art activist, and teacher from New York was one of those associate members. He made several extended visits to Santa Fe to paint portraits of Hispanic and Native American subjects like Julianita, a San Ildefonso Indian who posed for him on a number of occasions. When the painters who founded the Taos Art Society first came to the area, Taos was still remote and largely unsettled by Anglos. Along with the scenery, its “Old West” feel (which was already a thing of the past in many places) was a big part of the draw. 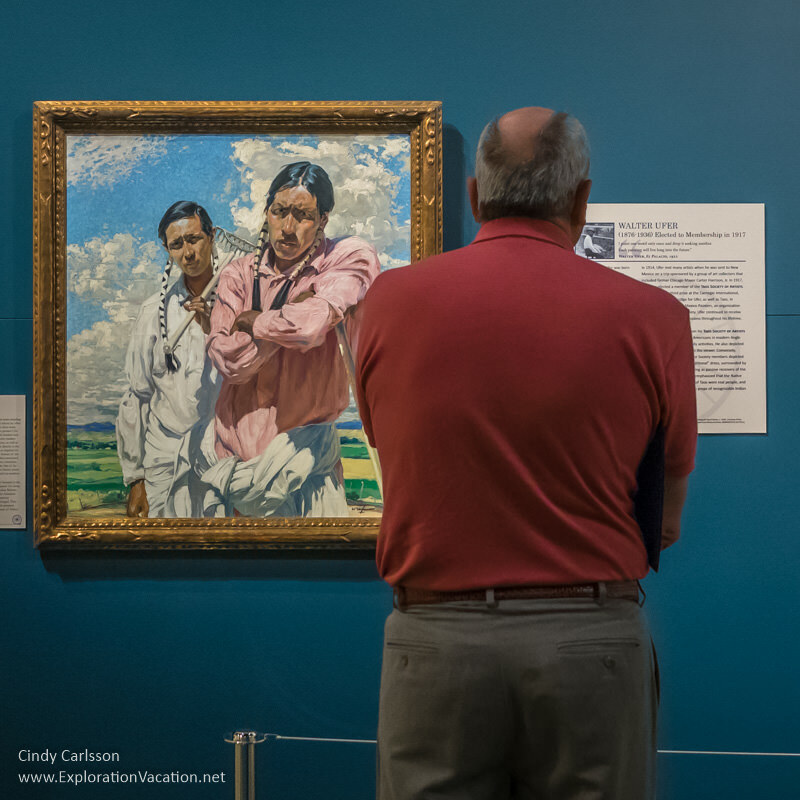 Taos still had Native and Hispanic communities living much as they had for generations – and the artists who came there hoped to capture these cultures before they vanished. However, even as the Taos Society was glorifying that culture in their art, they were also spurring its destruction. As they sent their art out to the rest of the country, a much wider audience became aware of the rich culture and beauty of the area. Soon other artists arrived, followed by art patrons and tourists. Taos grew and changed. 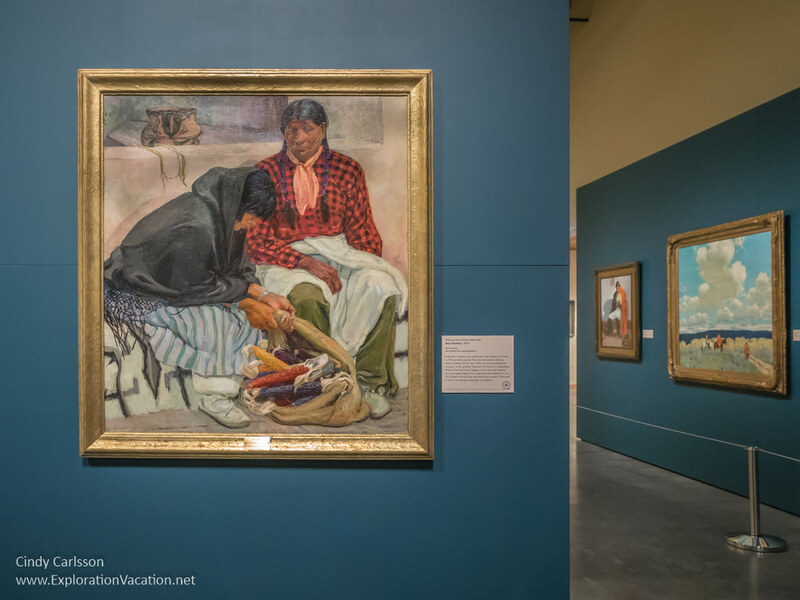 The exhibit at Western Spirit, Scottsdale’s Museum of the West, acknowledges that change, as a portion of the exhibit that features items from a trip the Sands family of Glendale, Arizona, made to Taos in 1924. Highlights of that trip included meeting and purchasing paintings from seven members of the Taos Society of Artists. Increasing numbers of both tourists and new residents put pressure on the existing community. Many of the scenes the artists came here to paint did indeed vanish. Like everywhere else, Taos changed. Still, while the Native people and cultures largely left the streets of Taos town, they didn’t vanish. Native Americans still live in Taos and the other pueblos where they maintain key components of their traditional culture. And, while the Taos Society of Artists folded in 1927, today the Taos area is home to one of the largest communities of artists in the country. The Taos Society of Artists exhibit will be on display at Western Spirit, Scottsdale’s Museum of the West, through the end of April 2017. This is the only place where it can be seen, so be sure to visit if you are in the area. Western Spirit is located near Scottsdale’s art-filled downtown. Parking is available in a ramp behind the museum. The area is also served by the free downtown trolley, making it easy to visit the museum and then explore downtown. I visited Western Spirit and the Taos Society of Artists exhibition as a guest of the museum. However, all opinions are strictly my own. I knew nothing about the Taos Society and am pretty impressed by the works of art they produced. The Church at Ranchos is my favourite. Something about the colours at the top of the painting. I love the contrast between the bright soaring church and the people milling about in the shadows below. It’s a cool painting. This looks like a fantastic exhibition. This is the first winter in five years I haven’t made it to Arizona for at least some part of the winter. I’d love to have been able to see this. I have not made it to Taos yet either, but hope to some day. Well, you do seem to have filled your non-Arizona time with other things! It’s been years since I’ve been in Taos (I get to Santa Fe, but no farther). This year I tried to convince my husband we should drive through there, but they had just gotten snow and the answer was no! Maybe next year. I remember is a lovely little place and and the pueblos are nearby, but I suspect it has changed some over the years. Fascinating exhibit, my favorite would have to be Julianita and Church at Ranchos! Yes, they are lovely paintings. There were lots other beautiful ones too – I just didn’t photograph all of them! Oh my gosh, this is right in my new hometown of Scottsdale! I hope I get a chance to visit before the Taos Society of Artists exhibition ends. What stories these paintings tell — each one has captured my attention. Yup! 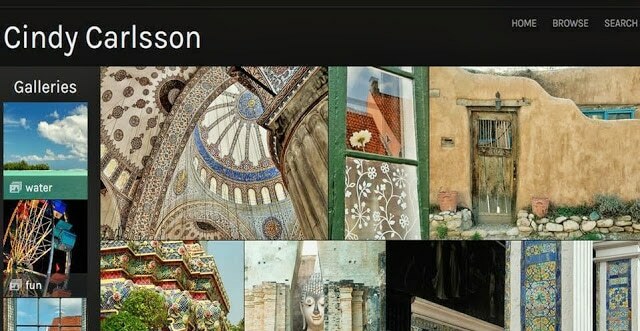 You have lots of cool things right in your new hometown – I’m jealous! This show only runs for a few more weeks. The other major temporary show they have on is also really good, a Coleman sculpture show. That closes as the end of next month, so two reasons to get over there!